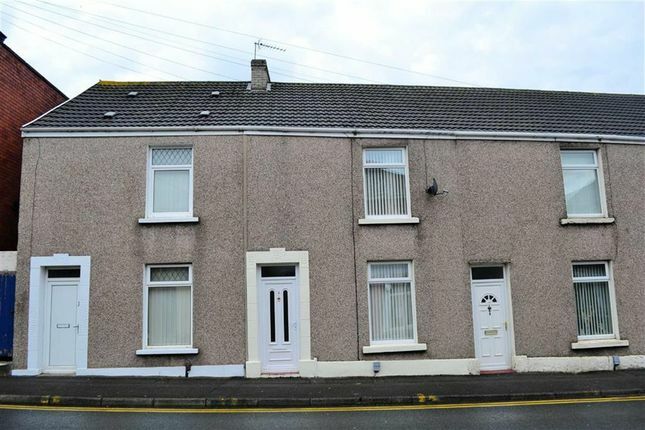 A very well presented three bedroom middle terrace property located in Sandfields within walking distance from Swansea City Centre and the foreshore. The accommodation comprises to the ground floor; lounge/dining room, kitchen and bathroom. To the first floor are three bedrooms. The property has the benefit of gas central heating and double glazing. We strongly recommend internal viewing of this property. Via uPVC door to porch. Quarry tiled floor, dado rail. Double glazed uPVC window to the front and rear, laminate flooring, two radiators, electric fire in marble surround and hearth, staircase to the first floor, coved ceiling, dado rail, fitted alcoves with feature lighting. A range of wall and base units with complementary wooden work surfaces, inset stainless steel sink, tiled splashbacks, radiator, chimney style extractor hood, plumbed for washing machine, stone tiled floor. Part tiled walls, uPVC door to the rear. A white three piece suite comprising; bath with shower over, w.c. And wash hand basin. Fitted vanity unit with feature lighting, tiled walls, frosted double glazed uPVC window to the rear. Loft access, radiator, built in storage cupboard, radiator. Double glazed uPVC window to the front, radiator, fitted wardrobes. Double glazed uPVC window to the rear, fitted wardrobes, radiator. Double glazed uPVC window to the side, laminate flooring, radiator in fretwork cover. Enclosed low maintenance rear garden.